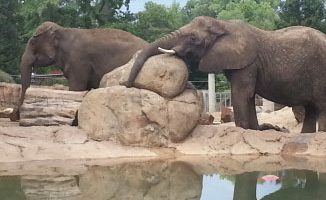 Why Do We Have Elephants In Accredited Zoos? The presence of live elephants in zoos will allow a bond to occur between humans and elephants. That bond cannot be made with pictures/paintings or other likenesses of elephants. It takes looking in the eye of a live elephant to really see the elephant and understand that the elephant also sees you. 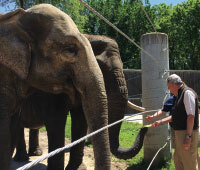 The ability to use other senses when encountering a live elephant also helps seal that bond – smell of the elephant, sounds the elephant makes, and for those lucky few who get to feed the elephant – touch. Research on elephants in accredited zoos provides information that can then be used by the other half of the global elephant conservation team – field researchers, rangers, and others working directly to protect and improve the lives of wild elephants in their native ranges. 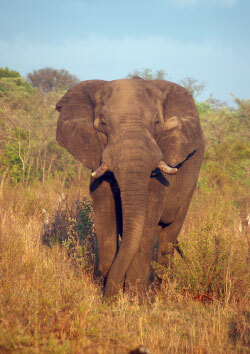 Elephants in accredited zoos help to ensure the genetic diversity of the world’s elephant population. They also serve as an “assurance” population – ensuring that if we have a crash in the population of wild elephants, we’ll still have that species available to increase the numbers of wild elephants to healthy levels by releasing elephants back into the wild. That is considering there are wild places available to release them back into. Accredited zoos are accredited for a reason. They provide great care for elephants.